I have refrained for a long time from writing down anything about the cholera because the subject is intolerably disgusting to me, and I have been bored past endurance by the perpetual questions of every fool about it. It is not, however, devoid of interest. In the first place, what has happened here proves that the people of this enlightened, reading, thinking, reforming nation are not a whit less barbarous than the serfs in Russia, for precisely the same prejudices have been shown here that were found at St Petersburg and at Berlin. The other day a Mr Pope, head of the cholera hospital in Marylebone, came to the Council Office to complain that a patient who was being removed to hospital with his own consent had been taken out of his chair by the mob and carried back, the chair broken, and the bearers and surgeon hardly escaping with their lives... In short, there is no end to the... uproar, violence, and brutal ignorance that have gone on, and this on the part of the lower orders, for whose especial benefit all the precautions are taken. 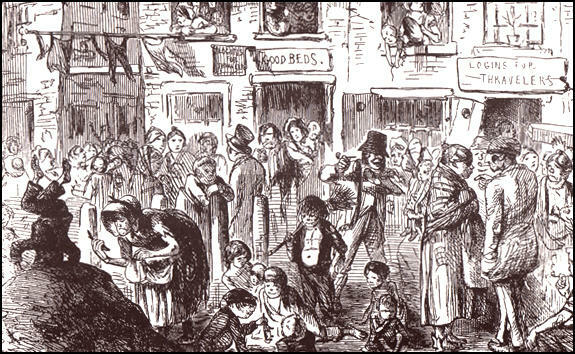 The Broad Street cholera outbreak began on 31 August and claimed over 500 lives in ten days. At its start Snow began to consider the local water supplies, and he suspected contamination of the water pump in Broad Street. He took a list of deaths from cholera from the General Register Office and mapped the location of these deaths around the locality. His analysis showed that the majority of deaths had taken place in the vicinity of the Broad Street pump and he presented this evidence to the local board of guardians. The handle of the Broad Street pump was removed, but although this incident has been recorded as the dramatic halt of the outbreak this was not the case, as the intensity of the epidemic was already receding. What is important about the event is that Snow's evidence succeeded in forcing local government action. A cholera inquiry committee was eventually set up by the parish to investigate the outbreak further, and with the help of Edwin Lankester and Henry Whitehead, the local curate, the original source of contamination of the water pump at the commencement of the outbreak was identified. 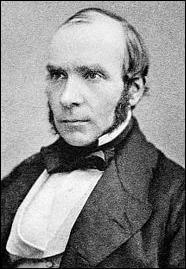 Snow's interest in water supplies to south London stemmed from the 1849 epidemic, when he noted that cholera fatality rates were particularly high in the areas supplied by the Lambeth and the Southwark and Vauxhall water companies. In 1852 the Lambeth company moved its waterworks to Thames Ditton, thus obtaining a supply of water quite free from the sewage of London. 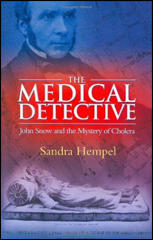 Snow undertook an investigation to calculate the number of deaths from cholera per 10,000 houses during the first seven weeks of the 1854 epidemic. He recognized the scope presented by such an epidemiological experiment, as it would include 300,000 individuals of both sexes, of varying ages and occupations, and from all social classes. His initial conclusions found that 38 houses out of the 44 where deaths from cholera had occurred were supplied with water by the Southwark and Vauxhall water company and he communicated these facts to William Farr. Farr ordered his registrars of all south districts of London to make a return of the water supply for all houses where there had been a death from cholera. The conclusion of this investigation was that the mortality rate for the houses supplied by the Southwark and Vauxhall company was between eight and nine times greater than houses supplied by the Lambeth company. This investigation was an excellent demonstration of collaborative working between practitioners in medicine and those in the newly emerging social sciences. Snow was unable to obtain the proof he required through traditional medical science, so he turned to the new public health data sources to provide evidence for his argument. The giant error of London is its present system of drainage. Probably in considerable parts of the metropolitan area, house-drainage is extensively absent: probably in considerable parts, the sewers, from the nature of their construction, are very doubtful advantages to the districts they traverse: but the evil, before all others, to which I attach importance in relation to the present subject, is that habitual empoisonment of soil and air which is inseparable from our tidal drainage. 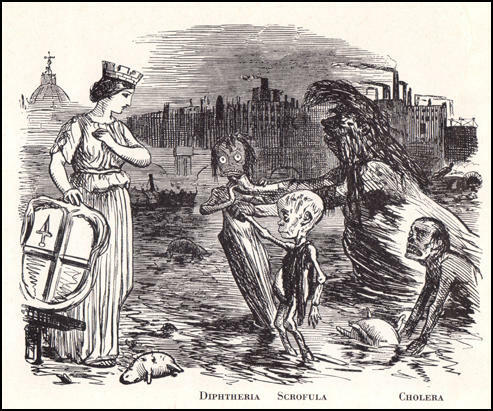 From this influence, I doubt not, a large proportion of the metropolis has derived its liability to Cholera. A moment's reflection is sufficient to show the immense distribution of putrefactive dampness which belongs to this vicious system. There is implied in it that the entire excrementation of the metropolis (with the exception of such as, not less poisonously, lies pent beneath houses) shall sooner or later be mingled in the stream of the river, there to be rolled backward and forward amid the population; that, at low water, for many hours, this material shall be trickling over broad belts of spongy bank which then dry their contaminated mud in the sunshine, exhaling foetor and poison; that at high water, for many hours, it shall be retained or driven back within all lowlevel sewers and house-drains, soaking far and wide into the soil, or leaving putrescent deposit along miles of underground brickwork, as on a deeper pavement. Sewers which, under better circumstances, should be benefactions and appliances for health in their several districts, are thus rendered inevitable sources of evil. During a large proportion of their time they are occupied in retaining or re-distributing that which it is their office to remove. They furnish chambers for an immense faecal evaporation; at every tide which encroaches on their inward space, their gases are breathed into the upper air - wherever outlet exists, into houses, foot-paths, and carriage-way.